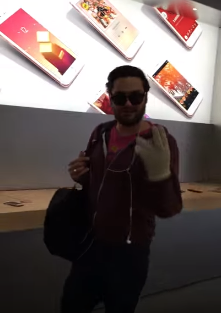 A French man casually walked around an Apple store with a metal ball, smashing every iPhone in sight. Mashable reports that a refused refund caused this man’s Apple anger (or iRate as I’m going to call it), but he really gave no shits. Strangely, the vandal appears to just walk out of the shop, leaving the security and employees stunned. Apple is a company that ‘violated’ European consumers’ rights. They refused to reimburse me, I told them: ‘Give me my money back’. They said no. So you know what’s happening? This is happening! Eventually the security catch up to the vandal, who is apparently being held in custody and under investigation. Maybe he just couldn’t deal with the lack of headphone jack?! Whatever the reason, this is going to be an expensive day for him.